Free Nights Offer – Get up to 2 Free Nights – Stay 8 nights and get up to 2 free nights. Please contact us for further details. Set on a hilltop, Four Seasons Seychelles is a fantastic hotel. 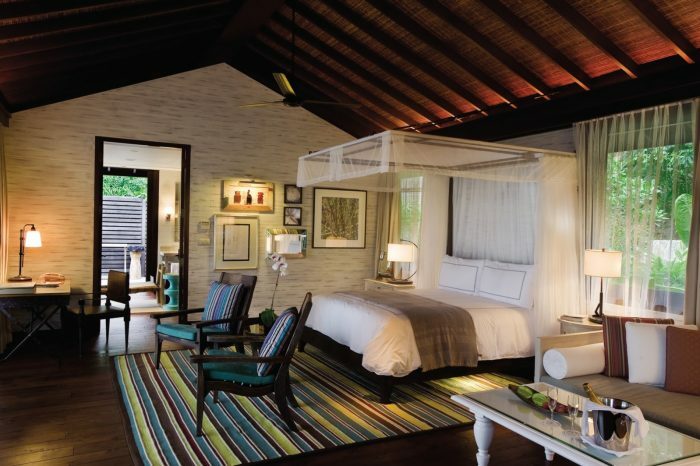 Rustic and earthy tones that are contrarily sleek make the Four Seasons befitting to Seychelles. Quaint views of the Indian Ocean are pleasing to the eye and the intensity of blue skies is irresistible. Four Seasons is an exclusive resort, with only 67 guestrooms, each designed to create an engrossing luxury haven in the Seychelles. Natural wood is magnificently carved to create stunning interiors. Each villa has its own infinity pool and outdoor deck. For lovers of nature, shower outdoors before relaxing the day away on daybeds. Spacious villas that are blissful retreats have outstanding views of the island and all that shimmers beyond. The Spa is cleverly located at the highest point of the resort, with endless, undisturbed views of the Ocean. Dining at any one of the restaurants will be marvellous, as guests are treated to international cuisines and local delicacies. For a moment of meditation and relaxation, the Hilltop Yoga studio is wonderful and the In house yogi is on hand to help you with your poses and stretches. Early Booking Offer – Stay at least 4 nights and save up to 25% off the room rate. Free Nights Offer – Get up to 2 Free Nights – Stay 8 nights and get up to 2 free nights. Even is guests are choosing not to indulge in a treatment, the Spa is worth visiting. Hidden away in lush foliage, this sanctuary is peaceful and relaxing. With such heavenly views of the Indian Ocean, guests can indulge in signature treatments designed to reinvigorate and reenergise. 8 treatment rooms are laced with calming, earthy colours and come with outdoor bath tubs and rain showers too. For a truly magnificent spoil, try the “Child of the Earth” treatment. The Hilltop Yoga Studio is phenomenal. Such perfect, picturesque views of the Island and Indian Ocean are seen from the yoga studio, that guests need to concentrate, as not to get distracted. The yogi holds yoga sessions daily to improve poses and private in villa sessions are also available. KIDS – For younger guests, fun and lively activities are put on daily, dedicated to their enjoyment. For a refined honeymoon, Four Seasons Seychelles is a fabulous choice. With a sweeping view of the Indian Ocean, from the hilltop location, is absolutely incredible and honeymooners are lost in romance on this paradise island. Local stone and beautifully crafted wood work is used to furnish this mind blowing property and guests feel at one with nature form the moment they arrive. Each villa is decked with an infinity pool with eye opening views of the Indian Ocean. Falling asleep as the gentle waves lap against the beach or feeling the soft breeze on your skin is an unbelievable feeling as you lay by on your day bed. Outdoor showers and spacious guestrooms are just staggering bonus features to these villas and guests are treated to luxury, creature comforts. Enjoy a couple’s massage at the beautiful spa, with fantastic views of the island or go biking or hiking to pass your day. For more energised activities, snorkelling and diving in the crystal clear waters are remarkable and guests are treated to marine life of the Indian Ocean. Although the dining choices are limited, the menus are extensive, full of local flavours and ingredients that are homely and comforting. dishes are beautifully presented. Paired with a dry white wine or full bodied red or a refreshing cocktail, guests are spoilt with the culinary treats.